HOW DOES THE PLANTATION SHUTTERS FLORIDA INC PROCESS WORK? 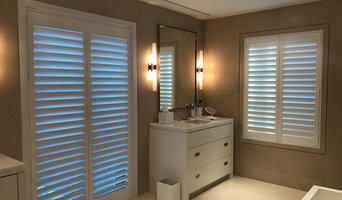 The Plantation Shutters Florida buying experience is a pleasant 2 step process, and it all begins with a call to (772) 872-6805, or an e-mail to santos@plantationshuttersfla.com. One of our highly-trained shutter design experts will come to your home and clearly explain all of your options and the difference between various types of home shutters. We will bring to your home. If you should ever have an issue, we are right here to fix it in a timely fashion. Our delivery times are FIVE DAYS on Poly. SEVEN DAYS OR LESS on painted BassWood compared to the six week delivery time from Local Retailers buying from foreign manufacturer. Call today for your free in-home consultation and free installation. 772-872-6805 "Quality Workmanship Never Goes Out of Style" Get Beautiful Plantation Shutters Like You’ve Always Wanted on Your Window Coverings Look .;.. Beautiful plantation shutters installed in as few as 7 days. Handcrafted wood or poly shutters, measured, crafted and installed in as little as 7 days. Call today: 772-872-6805 Plantation Shutters “Smart Options” Select our “Smart Options” program and you can choose from Canadian Hardwood or our super-affordable Ultra-Poly shutters, motorized or manual, and painted or stained in an unending array of shapes and sizes. Enjoy limit–less design possibilities. At Plantation Shutters of Florida you can choose from a wonderful selection of plantation shutters. You can choose modern Ultra-Poly shutters, Classic Hardwood Shutters, even state-of-the-art Motorized shutters. Or if you prefer, you can leave it to us and one of our highly trained design consultants will configure a unique shutter design specifically for your home, your lifestyle and your design aesthetic. Fit, Finish, and complete Customer Satisfaction is what you deserve in plantation shutters. And it’s what you get when you invite Plantation Shutters of Florida to enhance, or repair, the view from your home or business. All of our plantation shutters are made with high-quality sustainable woods and corrosion-resistant Ultra-Poly and hardware right in our own workshop in Stuart, Florida. We specialize in architectural designs, to include: arches, curves, floor-to-ceiling, doors, and unique sizes and shapes of all kinds. PlantationShuttersFLA.com. We are a local window treatment company that has been working in the blind industry for almost a decay. Respectful customer service and high quality work are our top priority. We offer wide selection of window solution that can suit any type of decor project by the best brands in the market. Our company is here to walk you through the entire process, from a Free-in-Home consultation, in which you can select your favorite products, to a professional installation. We service Palm Beach and Broward county, so you can schedule a free consultation at the best place and time that convenient for you. We look forward to working with you and help you achieve your decor goals. Custom Window Décor in Jupiter transforms homes into beautiful living spaces with high quality window fashions from Hunter Douglas. We specialize in PowerView Motorization. As your local Hunter Douglas dealer, you can expect great value on all our American made window fashions and each product is covered under Hunter Douglas’ fantastic lifetime warranty. Our design consultant helps each customer choose the right materials and styles to work with their decor and meet their light control needs. We have a large library of fabric for custom drapery - the perfect compliment to your Hunter Douglas Window Fashions. We have experience helping homeowners like you, choose the best window treatment to help control the Florida sun and add privacy to your décor. Whether you are trying to block the sun completely or you want to take advantage of beautiful diffused light. Many of our stylish window treatments not only cover your windows but also add energy efficiency to help on your heating and cooling bill as well. The options are endless and include convenient operating systems: from easy loop cords to hand held remote controls and innovative PowerView™ Motorized window treatments. You can enjoy effortless control of all your window coverings from the comfort of your chair or control them while you’re away from home. Our motorized blinds and shades are fully automated and work with most home automation. Visit our showroom in Jupiter Florida to see our Hunter Douglas window fashions or call today for a free in-home consultation. We proudly serve North Palm Beach County including the following Jupiter zip codes, 33458, 33468, 33469, 33477, and 33478. Custom Window Décor of Jupiter offers the finest window dressings custom tailored to your home's décor. We are a HunterDouglas window fashions dealer. Friendly and professional service is included with every order from consultation through installation. Our goal "to find the perfect window treatment for every window or door." Drape Couture designs and fabricates custom window treatments and soft goods. We supply blinds and shades, designer fabrics/trim and decorative hardware. Drape Couture has partnerships with licensed Interior Designers, expert installers and carpenters, faux painters, and upholsterers. "Smith's Hang-Ups" is your plantation shutter destination. We offer HunterDouglas, Vista, Norman and Mirosal. Choose from Real Wood, Faux Wood or PVC Vinyl. One person does the measuring, ordering, receiving, delivery and installation. Less room for error compared to most operations where many individuals handle your order. New name, same great service! Located in downtown Stuart since 2003, we have proudly South Florida by providing high quality, luxurious ready-made curtains that you may take home and try out before you buy or choose from thousands of fabrics and have custom draperies made. We also specialize in blinds, shades, bedding, upholstery, hardware, installation and more! Call today for a complimentary in home consultation. *Hunter Douglas Authorized Dealer* It's hard to believe that more than 25 years ago, I started selling draperies and blinds as a "shop at home" service in Miami. In 1992, I moved my family and business to West Palm Beach. A year later, Marquis Designs evolved into a workroom. My love of fabrics and trims, combined with the technical and mathematical intricacies of today's window has always proved challenging and exciting. I envision the completed room and quickly learned that I could help facilitate communication between designer, clients, and workroom; the key to successful window interiors. We pride ourselves on understanding your needs. We recognize the importance of providing service in a timely and professional manner. Window treatments can be complex and our team of professionals is always eager to measure, install, consult and brainstorm. Each of us on the Marquis Design Group team is sensitive to the need for last minute changes, measuring and re-measuring, working with delays and meeting the deadlines that often accompany construction. We have grown our business by referrals and honoring the relationships of you, the designer and your clients. If your are looking to update your window treatments for your upcoming project, give us a call today at (561) 430-2193 or click the "Contact Me" button to send us a message. We look forward to working with you! All Kinds of Blinds of South Florida, Inc.
*Hunter Douglas Authorized Dealer* All Kinds of Blinds is a family owned and operated company that has been providing Palm Beach and Broward counties with prompt professional service since 1988. We are humbly honored to say that the majority of our business comes to us on repeat and/or referral basis. We develop lasting relationships with our clients. You can rest assured that your complete satisfaction and confidence in us is our top priority. We have competitive prices on all horizontal and vertical blinds, shades, plantation shutters, motorization and an array of soft treatments - we have it all! All Kinds of Blinds can meet all of your window treatment needs. 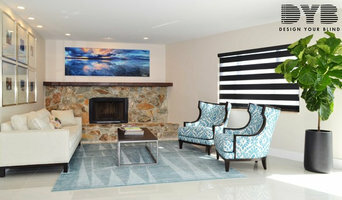 Native south Florida designer, has been in touch with area trends and styles for over 30 years. Unique style and attention to detail are key components that are provided to all cliental. We offer a full line of Interior Design Services. 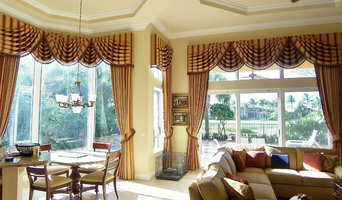 Specializing in Custom Draperies and Window Treatments,. Using your loved pieces, we work into your décor.. Let us inspire and enhance your world of Window Fashions and Interior Design. Relocating to Florida? Look at "Our Services" on our website. We help you decide what you should keep and what to leave behind. A small family owned business providing professional Window Treatments for your home or business for the past 9 years. We specialize in Plantation Shutters in Wood and Poly, Solar Shades, Horizontal Shades and Verticals. Since its founding, we at Budget Blinds of West Boca have proudly served the local community by offering high quality and stylish window coverings for any occasion. Our goal is simple: to provide you with the best products and services in order to enrich your home environment. Our lavish selection of window treatments includes shutters, blinds, draperies, shades, and more! Regardless of the window’s size or shape, you can rest assured Budget Blinds of West Boca will have a customized window coverings solution ready for you. Clara J’s Designs and Interiors is a custom drapery workroom located in Boca Raton, Florida, serving Palm Beach, Broward, Dade and Saint Lucie counties. We are dedicated to designing and creating exquisite window treatments for your home.